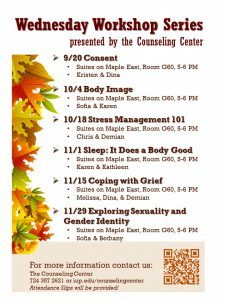 The Counseling Center will be once again offering a number of counseling groups to students! Research has shown that group counseling is as effective as individual counseling. Talking with other students who have similar experiences provides support and perspective. 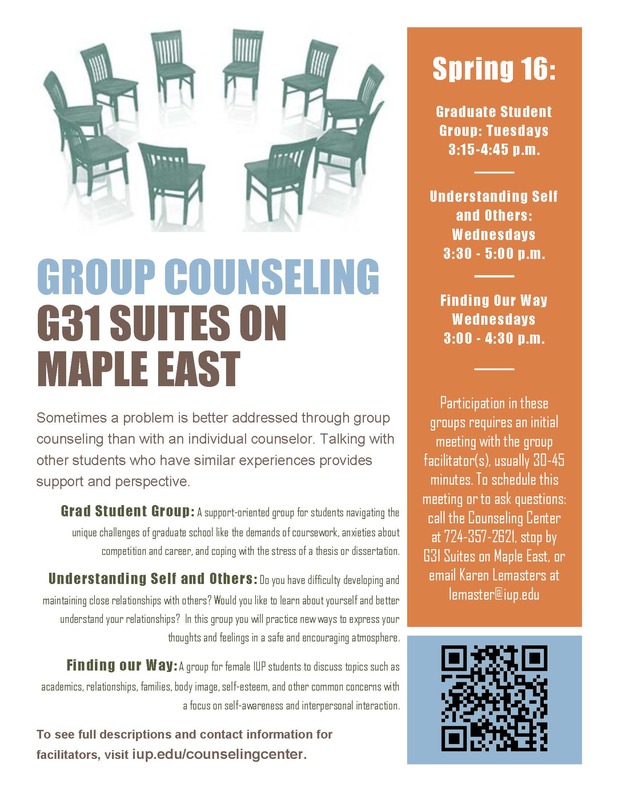 The following groups are offered at The Counseling Center in G31 Suites on Maple East. These groups usually include 4-9 students and are facilitated by two therapists. Group facilitators work to provide a safe, confidential environment where members are free to discuss their thoughts, feelings and concerns as they are comfortable. PennACE would like to recognize the achievements and contributions made by undergraduate students enrolled at member institutions who have completed an internship or co-op assignment. The JoAnne Day Student of the Year Awards were created for this purpose in honor of a career development professional. There are four categories, each awarding $250. In an effort to continue the campus dialogue on race, there will be a facilitation on race and white privilege by the Office of Social Equity’s Diversity Peer Educator program. If you are interested in applying for financial support for study or service abroad, an internship, or any other academic enrichment for the Summer or Fall of 2016, now is the time to act. If you are unsure about something that interests you or just need help with elements of the application or essays, contact me at kevinb@iup.edu. Status of arrangements: Admission status, whether preliminary arrangements have been made, deadlines, dates for funding, etc. The Sustainability Studies Program will be holding an information booth at the library next week, where we will be able to answer students’ questions about the new minor program. be offered for the first time in Spring 2016. The Indiana County Unit of the National Association for the Advancement of Colored People (NAACP) will be hosting its 29th Annual Freedom Fund Banquet on Saturday, November 14, 2015. The banquet will begin promptly at 6:00 p.m. at the Park Inn Radisson, Indiana PA (formerly Holiday Inn) located on Wayne Avenue. Dinner will be served at 6:30 p.m. The theme for this year’s banquet is America’s Journey for Equality. The speaker will be Mr. Chris Moore. Mr. Moore is best-known for his work on Black Horizons on WQED-TV. He has co-hosted and produced the Emmy-winning series, the longest running minority-affairs program on public television, since 1968. He also produced and narrated Wylie Avenue Days, an Emmy Award-winning documentary on the Hill District. Mr. Moore is a Grambling State University graduate and Vietnam veteran. We look forward to an exciting evening with him. Tickets may be purchased for $30.00 each and $15.00 for children under 18 years old and students. Advertisement may be placed in the program booklet on or before Wednesday, October 21, 2015. We suggest that you purchase your tickets and advertisement space as soon as possible, as this helps with our publication. If you are unable to attend the banquet, I ask that you send a representative and/or purchase advertisement space. With your generosity and assistance we can continue to offer support in educational and civil rights issues in the local community. If you are in need of further assistance, please feel free to send me an e-mail. Thank you for your continued support of the NAACP. Tuesdays, Wednesdays and Thursdays from 4:00 pm to 7:00 pm. The students will be K-8th grade. Especially looking for math tutors. Any students interested in cashiering at the book sale (who have their clearances) can contact Anne Cash at annecash@comcast.net to find out what time slots are available. Last year 20 slots were filled by CHC students — we hope by requiring clearances we won’t lose too many. Anne has already sent out a desperate need request!